The 'El Gordo' galaxy cluster, officially known as ACT-CL J0102-4915, contains several hundred galaxies. The total mass of the cluster, as refined by Hubble Space Telescope measurements, is estimated to weigh as much as 3 million billion stars like Earth's sun (about 3,000 times as massive as the Milky Way galaxy). Most of the mass is hidden away as dark matter. The most massive galaxy cluster ever observed in the early universe is quite a bit bigger than astronomers had thought. New measurements by NASA's Hubble Space Telescope suggest that the cluster nicknamed "El Gordo" (Spanish for "the fat one") contains about as much mass as 3 quadrillion suns. That's 43 percent larger than previous work had estimated, researchers said. The cluster, catalogued as ACT-CL J0102-4915, contains several hundred galaxies swarming around under a collective gravitational pull. The total mass of the cluster, as refined in new Hubble measurements, is estimated to weigh as much as 3 million billion stars like our Sun (about 3,000 times the mass of our own Milky Way galaxy). 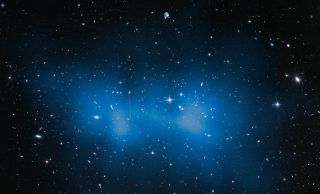 The El Gordo galaxy cluster— whose formal name is ACT-CL J0102-4915 — is located more than 7 billion light-years from Earth. So astronomers are seeing the cluster as it existed when the universe was less than half of its current age (which is about 13.8 billion years). El Gordo's mass was reported in January 2012 to be around 2 quadrillion suns. Researchers arrived at that estimate by studying the temperature of gas and movement of galaxies within the cluster using NASA's Chandra X-ray Observatory and the European Southern Observatory's Very Large Telescope array in Chile. The calculation had some uncertainty about it, however, chiefly because El Gordo may be the result of a collision between two constituent clusters. "We wondered what happens when you catch a cluster in the midst of a major merger and how the merger process influences both the X-ray gas and the motion of the galaxies," said co-author John Hughes of Rutgers University. "So the bottom line is that because of the complicated merger state, it left some questions about the reliability of the mass estimates we were making." It's possible, for example, that the geometry of the merger prevented the authors of the 2012 study from gauging the true kinematic energy of El Gordo's galaxies, resulting in a mass underestimate. And Hubble's new observations suggest that this indeed was the case. Astronomers have found clusters as massive as El Gordo — which contains several hundred galaxies — closer to Earth. But El Gordo's extreme distance makes the cluster special, since astronomers think such enormous clusters were rare when the universe was young. The study team plans to continue studying El Gordo with Hubble. The cluster is too big to fit into the iconic space telescope's field of view, so the researchers aim to get a mosaic image next. "We can tell it's a pretty big El Gordo, but we don't know what kind of legs he has, so we need to have a larger field of view to get the complete picture of the giant," said Felipe Menanteau of the University of Illinois at Urbana-Champaign.